Location : Ho Chi Minh, Vietnam. Experience: More than 5 Years. If interested please email your cv with relevant certificate to nassermanpower@gmail.com or nasser@jasmarine.com.my and if the requirement is not suite with your expertise please forward to your friends. Nam-Con-Son (NCS) pipeline is now transporting gas from Lan Tay field (block 06.1 of Nam Con Son basin) via pipe routing Lan Tay-Long Hai-Dinh Co. Offshore gas from this pipeline is treated by Dinh Co Gas Processing Plant (GPP). Dry gas is transported via Dinh Co – Phu My pipeline to Phu My Gas Distribution Center (GDC), which distributes to Power Plants at Phu My. 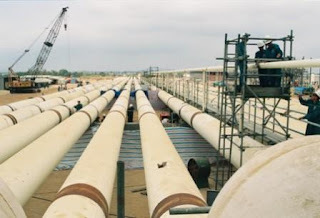 - Pipeline system transports fluid mainly from Block 05-2, Block 05-3 and Thien Ung fields. This pipeline is predicted to parallel to NCS pipeline and landfall in Long Hai, Vung Tau province. - Onshore pipeline from landfall location to GPP at Dinh Co and from GPP to GDC at Phu My. This pipeline is also parallel to existing Long Hai-Dinh Co- Phu My pipeline. - 270km 26” pipeline from Lan Tay field to Dinh Co GPP. - Dinh Co GPP which produce condensate & treated gas. - 6” condensate pipeline from Dinh Co to Thi Vai via Dinh Co – Thi Vai pipeline belonging to Bach Ho gas project. - 32km 30” gas pipeline from Dinh Co to Phu My GDC which distributes gas to Power Plants PM-1,2,3 & 4 and 20” Future Tie-In Points for under contructed Phu My – Ho Chi Minh gas pipeline system. - Phu My GDC has 04 compressor packages to distribute gas to above mentioned Power Plants. Total capacity of Phu My GDC is around 10.48 MMSCMD, and also has future tie-in points for other demands. - Common gas manifold at Phu My GDC for Bach Ho and Nam Con Son project. - Lan Tay - Dinh Co – Phu My gas pipeline with capacity of 7.0 BSCMY. This pipeline is also connected to gas pipeline from fields Rong Doi / Rong Doi Tay...etc.